There is a new vicar: the Rev. Kenneth Warren Hansen. Also in this year, the church sanctuary is raised, and an undercroft built as a “parish hall”. The undercroft is dug by hand and bucket through bed-rock. It was then expanded with poured cement and cinderblock. A new furnace is purchased for $800, with men of the church installing it themselves to save money. The former parsonage (“rectory”) to the north of the church (the sanctuary is visible on the left). Photo ca. 1940s. 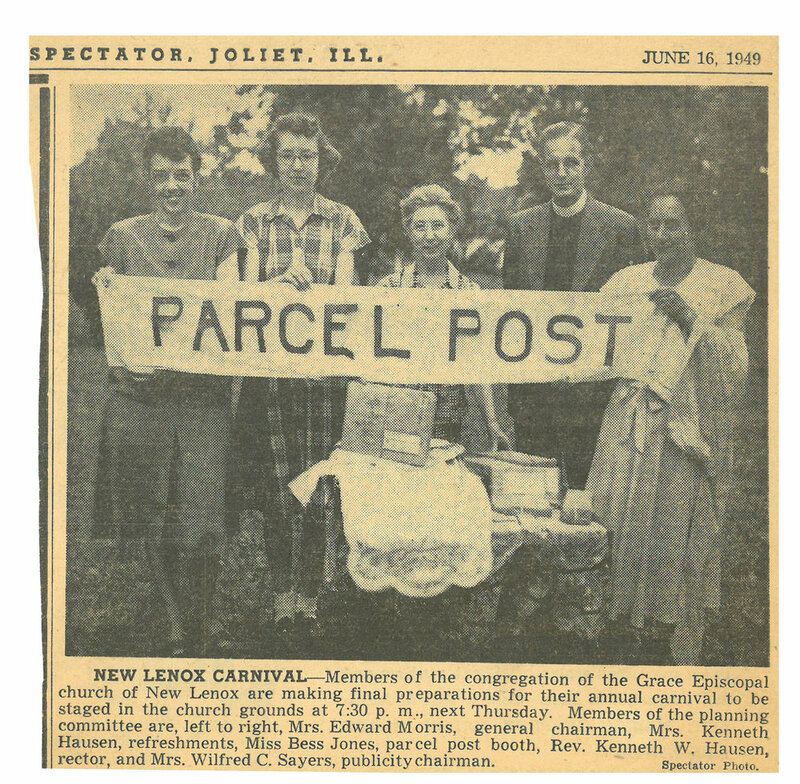 Article from the Joliet Spectator on June 16, 1949 about the Grace Carnial. The Rev. J. A. Hilton succeeds Hansen as the next Vicar of Grace. The 55th Annual Grace Church Carnival. The carnival started in 1896 and renamed Country Fair in 1978. Featured a Parcel Post Booth. Committee members: Mrs. Sam Carr, Mrs. Ed Moths, Rev. Hansen, Mrs. Art Rowswell, Mrs. Bill Penn (Marie Penn’s MS are Bill, a judge & Bob) Miss Bess Jones and Mrs. Wilfred C. Sayers. The new priest at Grace is the Rev. Harris C. Mooney, who is also a bachelor. The church pictured here in the late 1950s, when Humphrey Dixon was the Vicar. In the Bishop’s Report this year, Grace is listed as a parish reclassified as a mission. The Rev. Richard A. Crist becomes the next Vicar of Grace, brining with him his wife Mary, and their children. Crist would leave Grace in 1964 to enter the U.S. Navy as a chaplain. After getting his indoctrination at Great Lakes he went to Newport, Rhode Island. From the Chicago Daily Tribune, October 15, 1957: St. Paul’s Manhattan is featured in this article celebrating it’s centennial year. St. Paul’s Episcopal Church in Manhattan, IL, closes. Their records and transfer of parishioners came to Grace New Lenox. Grace was considered a northern extension of St. Paul’s at this time. A new priest arrives, the Rev. James Lovett Harper, along with his wife Sally Kelly Harper, and three children; James Jr., Mary Elizabeth, Catherine Kelly. Harper was born in Chicago Heights, IL, and served in the U.S. Navy during the Korean War. This is his first parish; he was ordained a priest in the same month he started at Grace. The Rev. William Orrick, rector of the Church of the Ascension in Chicago, assists the Bishop in the ordination at Grace. 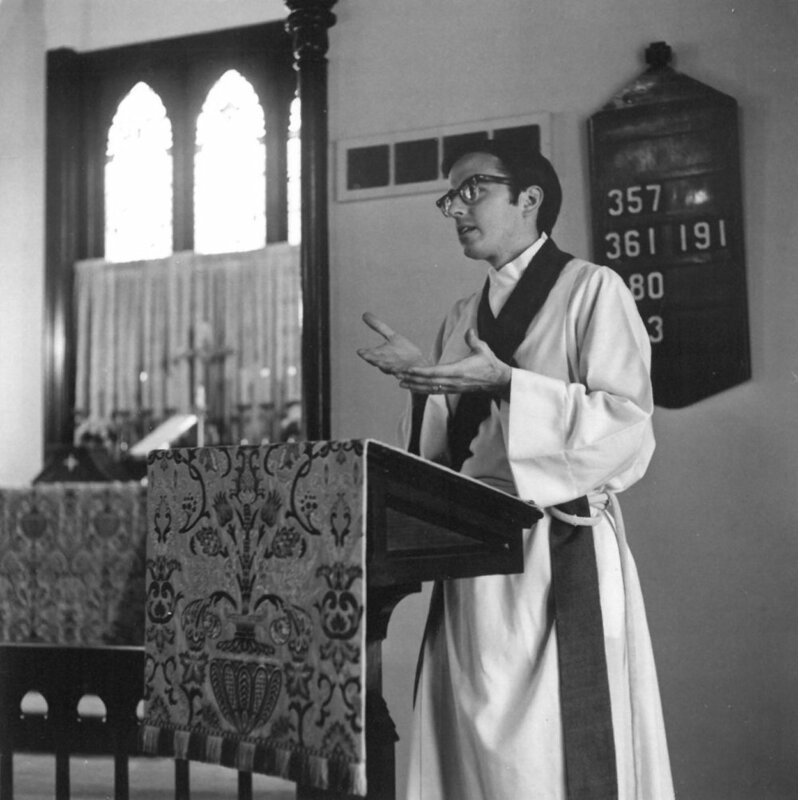 This is the church that donated the pews to Grace, see below 1966. Article from 1965 about Grace Vicar James Harper’s ordination. The Couples Club meets on Sundays at the home of Joe and Elda Mae Gougar. This was a social club made up of single as well as married members of Grace mission. The center aisle is made with “new” pews. The church now seats 100 people. Under the direction of George Fox, the old pews were removed, the floors painted, the woodwork was stained and varnished, and the pews from the Church of the Ascension, Chicago, were cut to size and refinished and installed. Also in this year, the original rectory has to be demolished when the house fills with water and steam after the boiler malfunctioned. Harper and his family are living there at the time. Frank Pester is responsible this year for adding a new 200-amp electrical service in the church. Verna and Wilford Gratrick made Grace their church. In this booth, we sell packages mailed to us by our generous friends. We charge one dollar for each package sold, and we ask the items be new and valued no less than one dollar - Copied from a letter written by Anna Parsons, Chairman, Parcel Post Booth 1969. Also, this year, a member of Grace Church, Verna Gratrick, is about to tackle new challenges at age 71. She has volunteered for the Peace Corps and will be going to Thailand next month for a two-year assignment. She has invited a Nicaraguan political refugee family to house-sit while she is away. Grace was able to be readmitted to diocese as a parish (self-supporting). This lasts for just six years, however. A memorial Electronic Organ is purchased. The funds had been given by family and friends of Ceward Charles Batson, Hazel Pester, August C. Rauch and Emma G. Rought, in loving memory of these departed members. Organist Judy Carr sets aside her salary as organist for years and placed it in the organ fund. Storm windows are installed on the church stained-glass windows. In this year, Fr. Hoelzel meets with new nearby residents Davie and Debbie Poole, inviting them to begin attending Grace Church. (Harry) Frank Pester dies. He was a life-long member of Grace; baptized on May 22, 1902, confirmed on May 8, 1921; and buried from Grace on March 20, 1975. He left 20% of his estate to Grace which was approximately $80,000 in 1975. In this year, Lois Schulz, “55 years young,” makes Grace her church. Two five-socket brass candelabras in memory of William Carson Lockwood by his sister Frodie Regan “Auntie Mame”. Two oak credence shelves in memory of Laura Jones Morris, Caleb Legh Jones, George & Ida Morris by Mary & Ed Morris. The biggest fundraising event of the year for the ECW was the publishing of a cook book. Notable parish burials in 1975: Wendell H. Cooper, Harry Joseph Mech, Jr. and Frank Pester. The Rev. Carl E. Giegler becomes the next priest of Grace Church, bringing with him his wife Beverly and daughters Elizabeth and Jean (and they all live at the Vicarage at 114 N. Pine St.). Giegler will serve for 14 years. Two crystal cruets with sterling sliver crosses ($41.86) purchased from The Albert Bailey Memorial Fund; Verna Gratrick’s father. Annual Country Fair held at Grace. Pet parade, dunk tank, bazaar, roasted corn, live music. Grace is returned to mission status with the diocese. The construction of the new parish hall is fully underway in this photo from 1979. On this date is the groundbreaking for the Parish Hall addition, over the place on the lot where the original rectory once stood. In this year and on this date, Grace celebrates 100th Anniversary of the consecration of its church building and dedication of Parish Hall, commemorated by the Rt. Rev. Quintin E. Primo, Jr, Suffragan Bishop of Chicago, and the vicar, the Rev. Carl Giegler. The Pancake Breakfast, the Bake Sale and the Country Bazaar are held by the ECW (Episcopal Church Women) of Grace at the VFW Hall in New Lenox. Adults are charged $2.50, 6-12 yrs $1.25, 6 and under .50. Pancakes, eggs, sausages, coffee are served. In this year, insulation is installed on the false nave ceiling of the church as well as being blown into the walls of the 1868 structure.